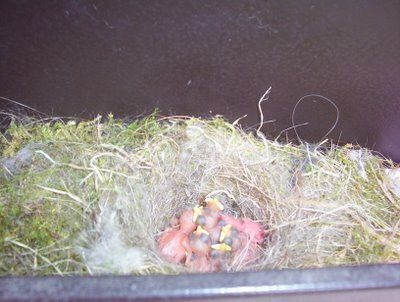 I've made Susan and Kelly both come over to try to steal a glimpse of the new babies in my mailbox, but one or both of the parents is always in there. I cannot believe I actually scored this picture! They are about the size of the tip of my pinky finger...and their little wings are so damn cute! OMG they are soooo cute!!! Thanks for sharing...please keep us updated! I wasn't able to count how many actually hatched...I know there were eleven eggs, but even with the ones that I saw, I was trying not to spend too much time gawking at their cute selves...So I don't know if all of them are even alive. Nature is sad sometimes. I'll let you know once they are bigger and I can sneak another peak though! Argh. I meant "peek" not "peak." I've been doing that a lot lately. My brain is fried. Oh, my goodness, what a neat picture. They're so cute and look so fragile.